Our Electric Vehicle Ride & Drive went great! We had around 150 people over the course of the event and there were plenty of great conversations, laughs, and education going on. 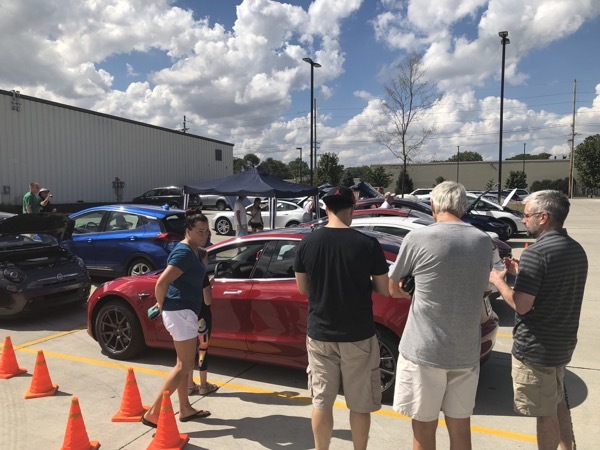 Vehicles pictured: Fiat 500e, Tesla Model 3, Chevrolet Bolt, Chevrolet Volt, Tesla Model S.
The Electric Vehicle Ride & Drive at the Foundry, will take place at the Foundry, which is a collection of four local businesses: a coffee shop, bike shop, toy store, and a cooperatively owned grocery store. Join us for a tailgate-style event in the parking lot with the grocery store providing food and other forms of entertainment. We've got a large parking lot that can accommodate usual traffic and the event. Registered attendees report 126,500 electric miles driven.